I think we all have this problem: there is no such thing as the perfect bag. Unless, of course, you design it yourself. After receiving a lot of positive feedback (and desire) from people who’ve seen it, I’ve also decided it will be made in a limited run. 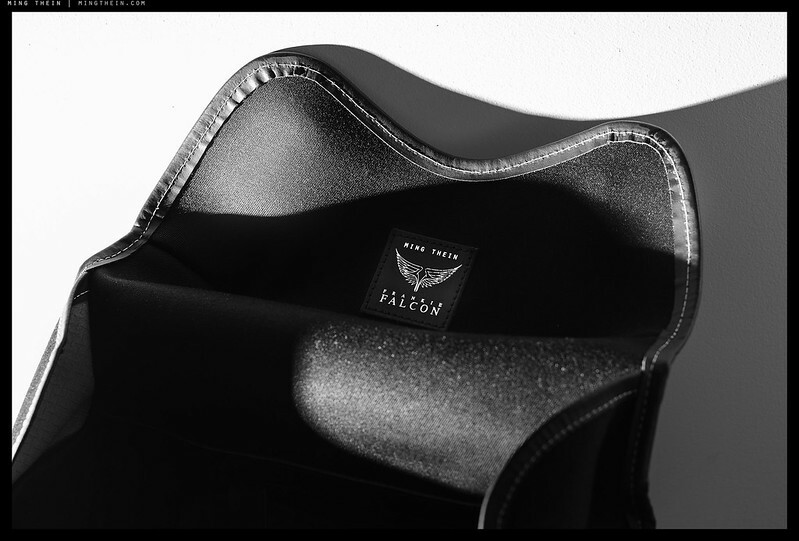 In collaboration with bespoke UK bag maker Frankie Falcon, I’m pleased to offer my first hardware collaboration: The MT x FF Ultimate Photographers’ Daybag. Orders for the first (and limited) batch will run until 31 October 2016. Final orders will ship 1st week December 2016. The order book is now closed. I will likely be offering a new (smaller) version by popular demand in early 2017. Thank you for your support! I’ve always wanted an urban shoulder bag that I can work out of: i.e. get stuff in and out, change lenses, sling out of the way. It had to be a shoulder bag because it’s fastest to open up to change lenses, and easy to put down when you have the chance. It’s also lower profile and stealthier than a backpack, without issues of access or strange configurations. It had to be able to store a decent amount of gear if required, be soft enough to form itself to your body for comfort, but rigid enough to stop things banging together. Plus ideally collapse down for situations when you have to stuff it in your suitcase – budget carriers, for instance. I’ve tried just about everything made in this category by all of the major brands and then some – but they all were either too padded, to small internally, or too rigid and not easy to work out of. It should have a minimal amount of exposed metal hardware to avoid scratches (no zips for this reason), and a sleek exterior with as few straps as possible to avoid catching on things. Omnomnom. I will eat all your gear. Note side wings to stop stuff falling out, or uninvited hands going in. This bag is a result of a) buying far too many in the past that haven’t served the right purpose, have been awkward to use, overpadded, unpackable in themselves, not durable, or just plain ugly. What you see is the result of both years of photography and figuring out what one really needs to hand practical walkabout situation, and what one can live without. We also went through four redesigns and prototypes in the process of arriving at this solution, and I’ve been using variants of this bag for the last six months. We’ve thrown away everything you don’t need, but left you with everything you do. As a bonus, it’s handmade in England from the same materials used on high end convertible sportscars. 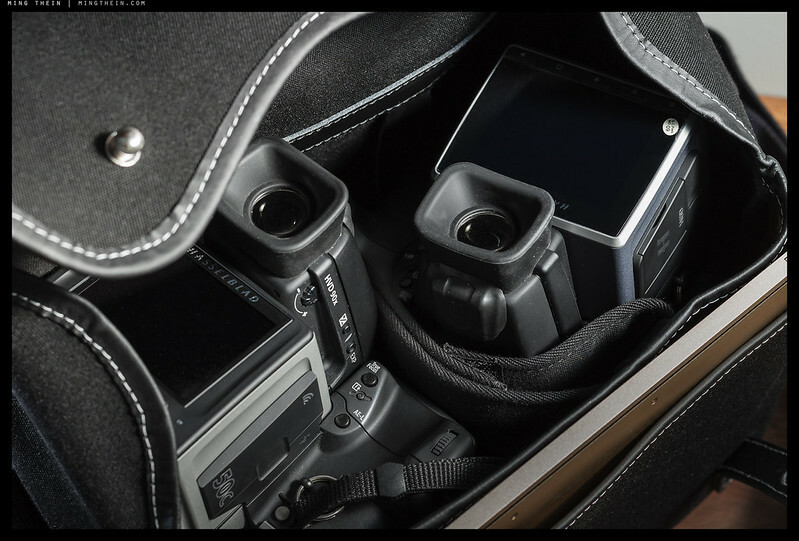 Two Hasselblad H bodies, lenses attached, and a laptop? No problem. It’s how I’ve been using it for the last month in transport mode, but most of the time it’s camera in hand and 2-3 lenses + accessories easily accessible over the shoulder. Firstly, you’ll notice there’s almost no internal padding. The materials used are thick enough to prevent bumping and chafing, and there’s strategic thin padding on the divider and bottom, but nowhere else. When was the last time you dropped a bag, but how often have you cursed at the wasted volume? 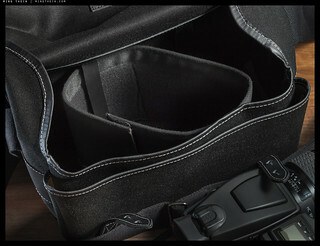 A lot of other photographers have been using non-camera bags for this reason, or unlined canvas photo bags like Domkes. Secondly, it’s got a much greater internal volume than it appears to have. The bag’s external dimensions are 31x24x16cm, which is small enough to count as your ‘personal item’ when you fly, but I can fit two Hasselblad H bodies, two lenses, spares, a full size iPad in the rear pocket, and a 12″ Macbook in the front laptop pocket with room to spare – or two D810s, three Zeiss Otuses and the same spares, iPad and laptop. A D810 or 5D-sized body will fit transversely – so you could put three in, with lenses attached if you were really masochistic. If you’re willing to forgo a bit of internal room, it’ll stretch to fit a 13″ Retina Macbook Pro. I’ve not been able to find another bag that can do this. I would like to claim this has something to do with advance applied physics, but it’s simply because we went strategic on the packing. Our new continuous loop divider. D810 transversely (with L bracket) – plus laptop; with three Otuses for size. Thirdly, you’ll see there’s only one piece of velcro in the entire bag, yet there are five possible configurations. In practice, we don’t need velcro everywhere. The internal continuous loop divider is threaded through four leather retaining straps at 1/3rd width intervals; by threading the divider through different combinations of the loop and securing it with that single piece of velcro, you can have either one big compartment, three equal ones, two equal ones or two unequal ones (L-R bias). And the divider is long enough that you’ll still have a third thin compartment between the two compartments if you choose the two-up route. I usually use it in the three compartment configuration: in the field, three lenses easily changed out, camera in hand; or two lenses, and one on the camera which sits in the middle. The bag was designed to be flexible and easily reconfigurable to adapt to multiple systems. You could stuff it full of Hasselblad, or just use part of it for a couple of Leicas or mirrorless cameras and the rest for your lunch and a sweater. Cameras slide in and out easily, and lens changes are a breeze. In addition to the main compartment, there’s a laptop slot at the front of the bag, under the main flap (which will fit up to a 13″ Macbook Pro Retina), two small internal pockets for accessories, and a rear slip pocket that will fit up to a 12″ iPad or Macbook. I put the main laptop pocket at the front of the bag so the rest of it can still bend comfortably to your body. Folds completely flat for easy packing. Fourthly, It’s lightweight, self-forming, fully collapsible, and water resistant. 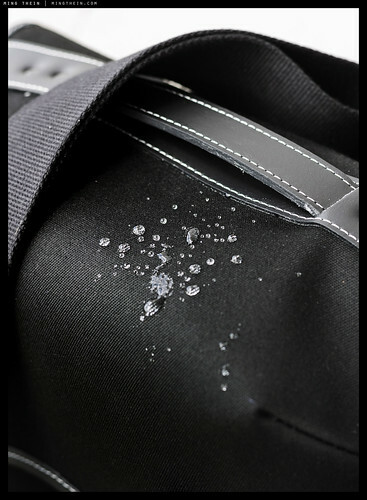 The bag is mostly double-layer canvas, of the same treated sort that’s used in convertible roofs – as you can see, it’s hydrophobic and water beads and runs off. If you remove the divider and fold up the bottom padding, you can squash it completely flat – making it easy to pack into your check in luggage. The bag weighs about 1kg empty. I wanted something with the style of a Billingham but more stealth, and the utility of a Domke but with a bit more structure: this is it. More important than that, however, is that it’s comfortable in use: there’s a top handle for quick pickups, the front tab closures are at a slight angle to pull the lid shut when using the handle. The shoulder strap is a continuous loop whose doubled adjustable portion goes over your shoulder for additional padding, and the strap itself is thick, wide, soft and flexible. The rear of the bag contains an extra layer of canvas (three total) for the right amount of rigidity, but sufficient give to shape to your body. Lastly, there’s both leather piping and a thick leather pad on the bottom (plus internal padding) to cushion your gear from the ground. It’s built to last from quality materials, which the manufacturer is standing behind with their usual 25-year warranty*. 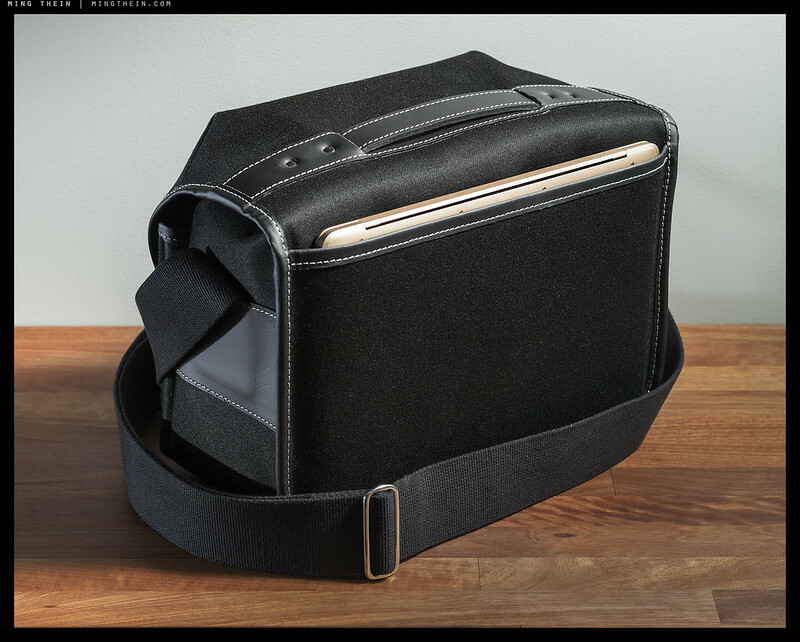 Rear iPad/magazine pocket – that’s a 12″ Macbook in there. Base leather pad: the bag sits on the rear piping and the front pad, with the majority of it actually not touching a flat surface. 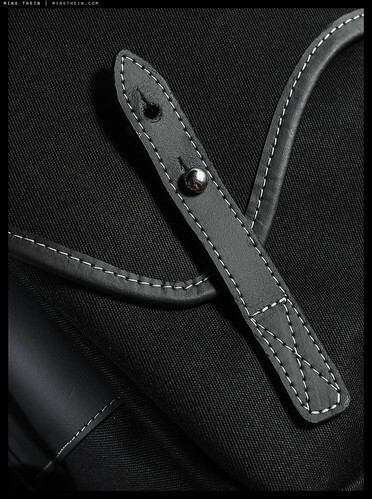 The bag will be made by hand in very limited production, with the order books open from now until 31 October 2016, with shipping in the second half of November with orders filled continuously in small batches – the first orders should be delivered ~early Nov, and the last by 2nd week December due to strong demand. The price of the bag is US$250, payable by Paypal at the links below (credit cards work too). $15 Regular shipping takes 5-10 day via air mail (not trackable), $25 express shipping is trackable and should be 3-5 days. Bags will be sent directly from the Frankie Falcon workshop in the UK, and we will email you the tracking number once your bag ships. Each bag is handmade, so please allow time for us to clear the queue! Volume pricing is available if you are a dealer and would like to stock the bags (please send me an email to enquire further). Please include your phone number in the comment box – this is required for the courier. If the box does not appear for you (PP has been having some issues of late) – I will have to trouble you to email it to me…thanks! Orders for this batch have now closed. I will likely be offering a new, smaller design in early 2017. Thanks for your support! Materials: Double layer water-repellant canvas, Italian calf leather, black/black with grey stitching. Handle in leather, cotton webbing adjustable shoulder strap. Leather ball-and-tab front closure with two positions. Production has begun and we will continue to shipping continuously – we we expect first bags to be delivered by the end of October (depending on customs, of course), and last orders by end of November/ mid December due to demand. Hi Ming.. I don’t recall seeing any update in 2017 (correct me if I’m wrong). Is there any plan to re-release it ? It seems quite a popular bag in your range and it would be a shame to not make it available again. Sorry, no plans to re release it. Please tell me this bag will be available again!!!? Finally got my bag a couple of weeks ago: it’s much heavier than I anticipated (but I was using Hubba Hubba Hiney before and probably this wasn’t very realistic on my part), and 12.7″ iPad Pro is not completely obscured by the bag: it pokes out a little when placed in the back pocket and shiny metal sides are partially visible from one of the sides when it’s in the front. The unexpected surprise for me were the two small side pockets: they’re perfect for spare batteries, room key and passport. I have a question: is it possible to close the bag single-handedly? After removing the camera from the bag I don’t always have it on a strap so one of the hands is kinda full, and there’s still some stuff inside so want to close the lid to ease my heart. But the amount of stuff inside is very little so I was unable to close it using one hand just yet. Will it become possible in the future after the leather softens up even more? Who knew that an iPad would be bigger than a MacBook 🙂 I was hopeful based on your 13″ remark, but I guess it’ll look kinda similar. And anyway with it and a camera it becomes pretty heavy so I don’t think I should carry it there even if it fits or I’ll crook my back even more. Thanks for the technique tip! Now I know what to aim for. Yeah, I should’ve asked for an image 🙂 But probably back then I thought that it was the 13″ MacBook on the photos already. One other aspect I didn’t have the chance to experience yet: how does it handle under the medium to heavy rain? Doesn’t the rear pocket collect water like a water jug? It’s a minor concern, but I think if left empty it wouldn’t be a problem in real life. Rear pocket is extremely useful: it’s possible to put something there extremely quickly. I’m regularly stashing rx100 or iPhone there to free my hands. With my winter clothing layers on I don’t really notice even an rx100. And if I wasn’t clear enough in my previous comments: I like the bag design (both visual and functional) very much. Thanks! And I guess even if the water will get to the rear pocket it won’t cause an internal leak (as the fabric is most likely rubberised inside), and could be dried out afterwards, so I don’t consider it to be a real problem. It is. All canvas is a laminate with a rubber internal layer and bottom layer; the top is two layers of this sandwich. Not to break up the Apple love, but I thought I would say that I just received my Dell XPS 13 and it is a tight, but successful, fit. I’d also add that there are few camera bags where the whole thing is waterproof. If I know I’m going to get wet, I’ll likely take another bag or find a rain cover just to be safe. I guess the XPS13 is about the same size as the new 13MBPRTB? Comparing the XPS13 to the 13MBPRTB: looks like the width is almost identical, the Apple is about half an inch deeper (so it would stick farther out of the rear pocket, and they have about the same maximum thickness. That being said, the Dell is thinner at the bottom end (according to the specs, it goes from about 0.3 inches at the end closest to the user to 0.6 at the hinge end), which allows it to more easily slide down into the pocket. Like I said, a tight fit, but it works. Update: Went through several heavy rain days with the bag and the concerns about the waterproofness of the rear pockets were completely unfounded. I had the bag pressed to my back and the paper I had in the rear pocket stayed completely dry. And it’s possible to fit A4 unfolded papers there as well. Usability of the bag when I’m just using it for normal life is stellar. I tried a prototype with a back flap – the leather is just too stiff and doesn’t fall properly. So, no go. I received the bag just before Xmas and have been putting my stuff into it. The bag is well made, the side flaps are effective against rain. 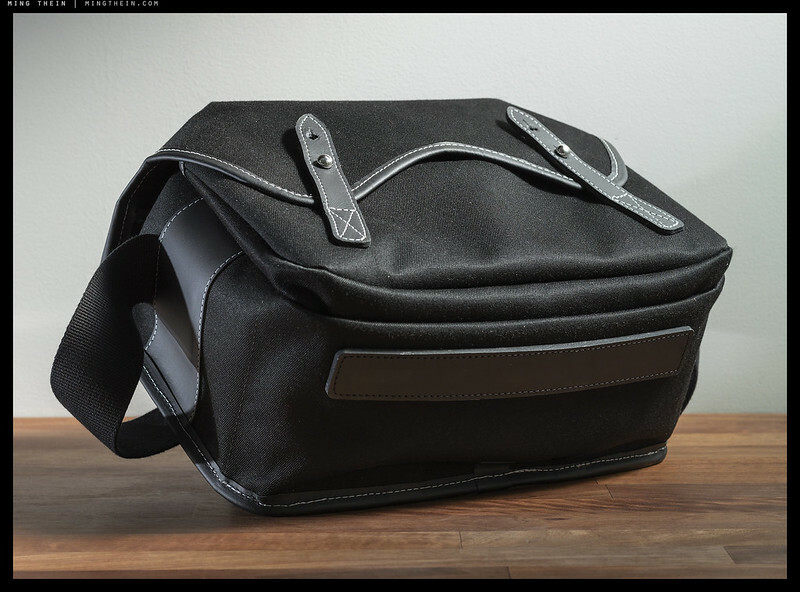 While it looks to me that this bag is perfect for DSLRs or MF type bodies, I wonder how good it is for smaller mirrorless system. I now have a Sony A7R2 body, A6000 body, and usually carry 5-6 prime lenses (small ones e.g. Loxia, Zeiss ZM types and the light weight Contax C/Y). With the inbuilt separator, I see that I can pack both bodies with lens fitter and just one more lens but there is a lot of room for the gear to slide around. So, does anyone complement the bag by putting your lenses in pouches? I definitely don’t want my lenses rubbing against each other “naked” leaving marks behind. In addition, how can I add separators considering the inside material is not velcro friendly? Last, how can I attach a tripod to the bag? I usually carry a Gitzo 1542T with Acra Swiss P0 head. To be honest – it wasn’t really designed for smaller cameras (notice how none of the usage cases show it). However, since it seems most of the better lenses for these systems are also pretty huge, I’d have imagined three slots / three bodies each with a lens attached. Otherwise, I’d use pouches. Tripod – again, not designed for this, but the easiest way would be to hook a leg over the strap behind. I’m working on a separate tripod harness though. I waited a while to post my thoughts on the bag as I wanted to use it as extensively as I could. 6) The usual collection of travel documents, my travel audio kit and miscellaneous items. I left the best bit for the last and for me that’s the comfort of the bag strap and my ability to shoot it in rain or snow. I shot with it during a say of steady rain and snow in Chicago and didn’t face any issues. Gear remained nice and dry and the bag didn’t acquire any odd color spots or any other issues. Thanks to the lack of padding and simple divider system, I regularly use this as a non-photography day bag as well. In summary, if it isn’t obvious, I’m very happy with the bag and would happily recommend it to anyone. Thanks Praneeth – that’s far more gear than I’ve attempted to fit in! Finally received my bag yesterday, despite UPS’s best efforts to ensure it never got anywhere. I am impressed with the quality of the materials and construction. When I unpacked it I said to myself, “Oh boy, this is pretty small.” Then I started putting stuff in it. It does really hold a lot of stuff. Now I need to retrain my brain to pack in a different way. For example, to use my lens bags for padding where necessary. 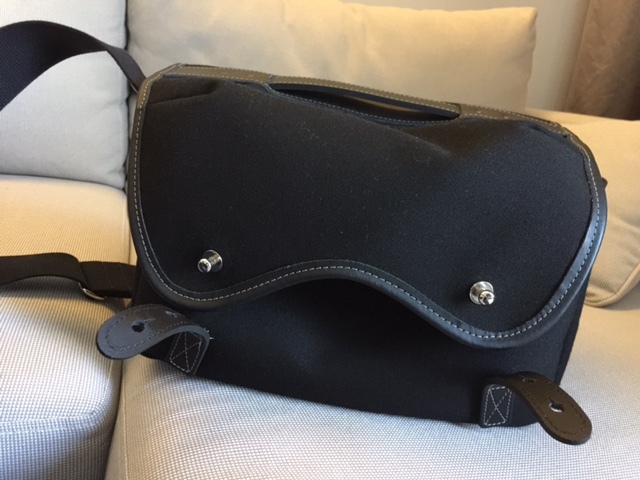 The one thing I would say (and it applicable to all messenger style camera bags so it is a very small nit) is that I wish someone would figure out a design that lets you lift the bag by the handle when the top is unlatched and not make you feel like everything will spill out. Overall, I am very impressed with this ting! I got mine a few weeks ago, but haven’t had a chance to use it much yet, but it’s very impressive how much they bag can hold. When I first got it, I was a little nonplussed by the size of the box and then the bag when it came out of the box: it’s so small! But then the thing starts swallowing equipment like a little black hole. I couldn’t believe I could fit two gripped DSLRs in it too. Here’s a photo of a Nikon D810 and D500 with their battery grips, along with the Nikkor 24/1.8G and Tamron 85/1.8 lenses mounted. I don’t think I could put more stuff in the bag beyond batteries, but even then the bag makes those cameras look small! As Kai mentions below, the leather straps’ buttonholes are a little stiff at first, but they soften up pretty quickly: about 2-3 unbuttonings in my case. Hope these image embeds work! That’s what I tried, but it didn’t seem to work. It could be that those photos are marked as private, and I used the guest pass feature to let people see it. That might be it – I couldn’t see the embed option on Flickr either, and usually it exists with public images (even if they belong to somebody else). I am writing this mini-review from the perspective of an enthusiast photographer, who uses a full frame dSLR set up and already has experience using a range of camera bags from shoulder bags (Billingham Hadley Pro, Crumpler), sling bags (Lowepro) and half day backpacks (Lowepro, Manfrotto). I was immediately struck by the quality of the design, materials and workmanship. In my opinion, it is peerless and a step up from the already excellent Hadley Pro. The attention to detail can be seen in the beautiful stitching and how the materials have been trimmed and cut perfectly inside as well as outside the bag. The inner divider design is genius: efficient, effective and elegant are the words that spring to mind. The only thing I had difficulty was, was the stiffness of the buckle –strap attachment. I suspect this just takes time to wear in, so no biggie. The main strap is perfectly judged for material, width and thickness, and the bag somehow holds its shape despite the intended limited padding. In contrast, the Hadley Pro’s bottom is horribly floppy without the padded insert and so it doesn’t really make for a nice shoulder bag on its own, plus the strap is too thin. The MT x FF fixes all that. Well, I put my D3s with 24-70mm, 70-200mm f4 and Zeiss 18mm prime inside, and had a lot of room to spare. 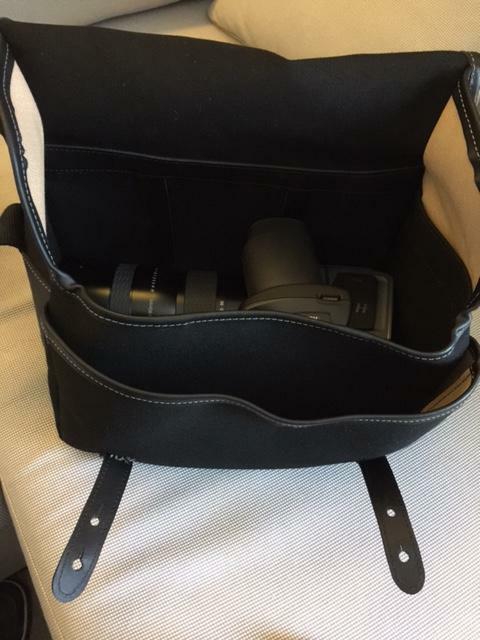 The Hadley Pro cannot fit the D3s with any lens attach without creating an unslightly bulge. I’m really pleased with the MT x FF bag. It’s beautifully designed and constructed, and allows me to carry relatively large camera gear in a quality small and stylish package. PS: This is the third attempt at posting this review, I wouldn’t normally bother, but wanted to persevere as I thought it might be helpful. Will try to post a link to a photo of my gear inside the bag. It really is a fine bag. But pernicious, as now I want more gear to fill it…. Am trying to persuade myself I can fill the spare space with books… but a nice big lens seems called for. And here is the bag with a Nikon D3s with Zeiss 135mm f2 attached, plus Nikon D700 with 24-120mm VR f4 attached, still plenty of room for a flash and triggers if I wanted. Impressed. Hi…the bag finally arrived 2 days ago…First I have to say this is a bag that has Excellent build quality. I do have a question. In the pics you posted of the bag it shows various configurations of the camera/lenses (at least from what I can tell) fitting in the bag. Well it works fine when I have my H6D + 80mm sense. However I use the H6 + 35-90mm as a go to lens when traveling. One of the pics that you posted above shows the camera H+35-90mm sitting on the bag. However when I tried putting the camera + Lens in the bag it does not fit. Thanks. The 35-90 mounted won’t fit unless you put it in without the divider and nothing else – it wasn’t designed for that. It does fit if you choose not to put anything else in the main compartment, and both components will fit if separated, so it’s not misleading. You also didn’t ask before ordering. Return policy is clearly stated in the T&C at the bottom of the post: all sales are final. Ming Thein…there are times when you have to ask yourself am I doing the customer justice? If I can afford a $27,000 camera and another $10,000+ of lenses, I can surely afford to eat the cost of your case. However it is a matter of principle Sir. I bought it based on the description and Photographs you provided in your post. Ask anyone here and they will tell you by showing the camera with the larger lens on it is misleading. You accept this or not is another question.You could have quite easily corrected this issue but you chose not to. I was going to buy some additional items from you but based on your handling of this, I am having second thoughts. I’m sorry, but I still fail to see what the problem is. You insist a H5/6 and 35-90 attached will not fit in the bag. It is not physically possible to put it in vertically as the dimension of the bag is smaller than the length of the camera, and no amount of clever design can change the laws of physics. However, I have said three times: remove the divider and it will fit horizontally – as you can see from the attached image. You can also see there is still space for other items behind it and underneath or on top of it, in addition to the front pocket, rear pocket and internal side pockets. Please explain how this is misrepresentation. Finally, the terms of sale were clearly stated. 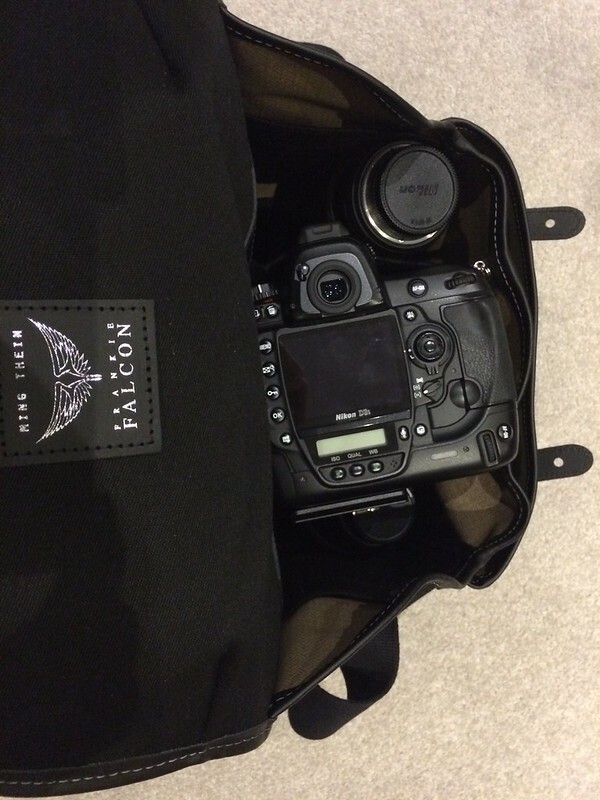 Thanks for sharing the picture…If I force it in, it fits…it is a very tight fit, with the rubber eye piece rubbing against the side of the bag, front of the lens obviously against the other side. If I take the UV filter off the lens, I gain 2-3mm, but its still tight and needs a little adjustment to put the camera/lens back in again. 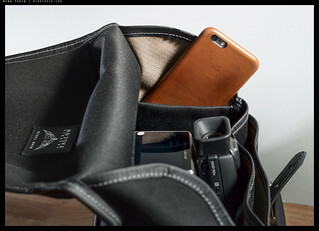 I tried this use case in the house, and what I am finding is that if I am able to get the camera out of the bag, I can definitely not put it back in as easily, without having to use both hands and fiddle with the bag/camera to get it in. Remember I am on the street and I will not have a nice table/sofa on which I can place the bag first totally flat, and then slide the camera in! My hope was to use this bag on shorter casual trips and not have to pull out the Pelican case. Bottom line is the bag is useful within a certain usage scenario. Maybe a 80mm + one other smallish lens, then you are good to go with this bag. If you want any long lens then my opinion is this bag is not the right choice. As for build quality I cannot fault the bag, it is still the best looking, feeling, smelling (yes the leather) bag I have owned, but I wish it was even an inch longer and all this would have been a no issue for me. I still stand by what I said, that showing the camera sitting on the bag infers that the camera will fit. Now is pushing it in regarded as fits? debatable. You may disagree, and some of your loyal followers may agree with you, and that OK. They can argue all day long on your behalf, but it still does not make the bag any bigger, or take away the fact that maybe showing the H5+35-90 may have misguided someone like me. No one is perfect and we all make mistakes. End of the day that is my opinion and I wanted to share with others so that the correct expectations are set. I will say that you could have easily not published my comments but you did and I commend you for that. I assume you’re removing the velcro divider piece entirely? I just tried what you described: it still fits, and it still goes in easily without squishing the eyecup. I’ve used it in the field on many assignments with two H bodies with lenses attached (up to 150mm) without issues. Note that the 35-90 is the largest of all of the H lenses, too. Just to provide an update. The H6D did eventually fit in as Ming mentions. It took a little breaking into the bag. At the time of writing the above comments I was planning a trip to UK and UAE over the Christmas/New Year period. Everything went well for the first 8 days. I had the bag and camera on my shoulder all the time. One camera buff even recognized the bag on my shoulder at London’s Heathrow Airport :-). I was however finding the front tie straps to be extremely difficult to take off and put on. I contributed this to the newness of the bag, and over time they did get easier to use. This morning whilst sitting in my hotel room in Dubai, I was about to load my camera into the bag I noticed something disturbing. 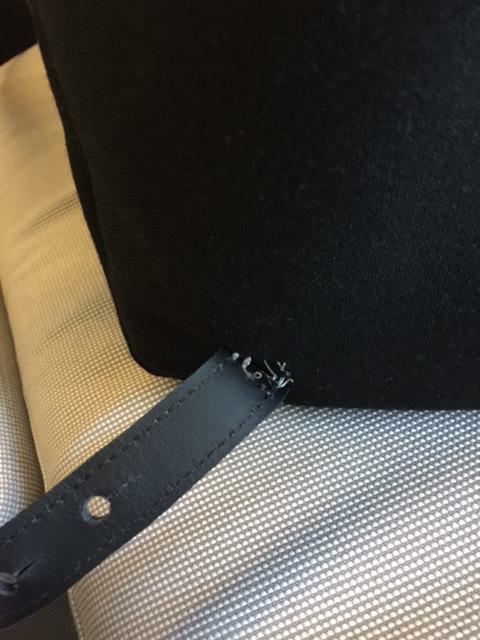 One of the leather straps at the front of the bag has started to come apart at the stitching after less than 2 weeks of travel, I also noticed a slight tear on the leather piping (less concern) at the moment. I have tried to include some pictures here, but in case I am unable to embed I am also attaching direct links too. As soon as I get back I will be contacting the manufacturer for warranty repair. Given I am in the USA and it will need to be sent back to the UK when I only just received it less than a month ago is not a good sign. Now I am going to be spending more money on shipping, and I will be out of a bag for a good amount of time while it is being repaired. Just wanted to share my personal experience. Just to put closure to this. A brand new bag was shipped to me and it arrived early last week. I have been away on business and had not opened the parcel till recently. First things first. EXCELLENT, EXCELLENT customer service. Thank You Ming for addressing this issue in an expedited fashion. Second, as the bag started to get used during my trip, the H6D+35-90 did fit comfortably in the bag, and was as easy to take out as any other camera. My initial observations were with a new bag, and even though were true at the time, I will say I have zero issue with the bag’s fit etc at this stage. Lastly, and I have said this before, Ming’s/FF product is top notch. So the million dollar question is would I buy it again from Ming if a future opportunity presented itself? The answer is 100% YES. Glad to hear it 🙂 Strange anomaly with the first one, but these things do happen and it’s our job to sort out as best we can. Enjoy! I must be missing something because I don’t see anywhere in the text or images Ming stating or showing that a 35-90+H6/5 will fit in the bag in addition to other gear. That combo sitting on top of the empty bag doesn’t automatically suggest it’ll fit in any orientation, that’s extrapolating far too much from a single image. But even if I go by that logic, he only shows the H6+35-90 and nothing else on the bag and the H6+35-90 will still fit in the bag as shown by Ming above. Also if you take time to read the comments below, many people who were unsure asked Ming for their specific needs and were given detailed and specific answers. And the return policy was very clearly stated in the post too. I don’t think it’s fair to Ming to say he has mislead you or is acting inappropriately. Honest mistakes do happen. I’ve purchased products without asking the right questions before and if a return is not possible, then I accept that there was an oversight on my part. Hi Ming, I ordered mine on Oct 12. Any idea when it will be shipped? Hi Kai, just dropped you an email. Hi Ming! Any updates on the shipping schedule? I feel like a kid at Christmas waiting for it…..hoping to be able to get it while here in the US before I head back to India…..
We’re about a third of the way through and should be done by first week December. You’re in the second third, which I guess means shipping in a week+ ? I took delivery of my bag today and let me just say WoW! 🙂 It is truly a quality item, no doubt about it, and it looks gorgeous. The most important factor, however, is how much stuff I can fit in it. When I first handled it I was doubtful since it looked so small, but then I started putting stuff in. Let me tell you, it eats cameras and lenses like a black hole. Empty compartment: use it as a lens change hole; just drop the old lens in and pull the new one out. I find it faster working in the field this way. Hi Ming. I procrastinated for a while, but finally pulled the trigger last night and bought one. My question though is, how do you carry your tripod when you’re on the move? Thanks! Right now, regular shoulder strap – and it’s annoying. We’re working on a solution for this, too. $362 in Australia.. just slightly too much for me right now. But I’ll be all over the next one. (15% smaller, a different, more secure main closing mechanism maybe) but everything else the same. Well done . It’s a great bag for sure..
Can’t promise it’ll be exactly this, of course…but thanks. 1) my typical set up would be a d700 or d3s with a 24-70 2.8 and 70-200 f4 with one of the lens attached, plus a Zeiss 18mm prime; how would that combo fit, in terms of placement/configuration? 2) when travelling on budget airlines and packing down/flattening the bag to put in a suitcase, how do you pack your camera gear? Easy jet in the uk only allow one carry on as free, any else checked in or otherwise is charged. That’s where I have found the padding on a Hadley pro useful, but is does occupy half my carry on suitcase! 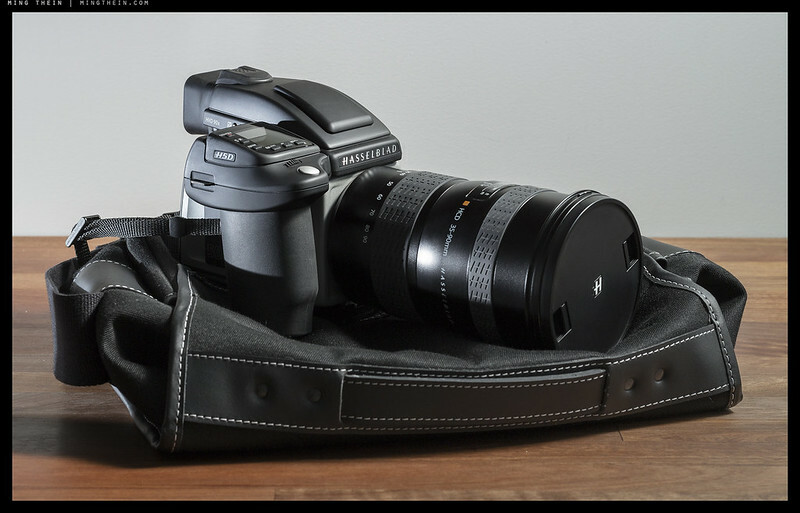 Would I get a space advantage with the MT x FF by flattening the bag and wrapping the camera and lens in soft clothes? 1. 70-200 left compartment, 24-70 and body attached centre, 18mm prim right. Lots of extra space. 2. I will take a large think tank roller on board, and put the day bag in my suitcase. You can’t flatten the bag if it’s full. The inner compartment of our bag definitely is deep enough for a D3 body (the H bodies have a similar square cross section) with lens attached; it was designed for this. I placed my order, Ming, but I had too follow up with an email correcting the proper delivery address. I do not know why the Paypal system did not select my default address with my post office box number. Thanks John – received, noted and replied. Is it a fantasy to assume that the bag would hold a Leica SL with a 24-90 attached and 90-280 in a side compartment? Have found no day bag that will do this comfortably. I was about to order one anyway, but this is quite sweet icing on the cake! Quick question – I live in the UK where the bag is made; if I order one will it be sent to me directly from the UK? If so I’ll go for it, but if it goes to the States to come back then I won’t – hope that makes sense. I just happen to be in the market for a bag right now. When I”m travelling, I usually carry around an LX100, OMD with several lenses, a sweater, water bottle, and small umbrella. Maybe a small a guidebook as well. Sometimes an iPad or laptop, but I usually keep that in the hotel. Would this bag work or would the size be overkill? Also, I like bags that can do double duty as non-camera bags. Would this work? Presumably, I could stick in a laptop, a book or papers, a sweater, and water bottle. On another note, just wondering what you do about water bottles when working in the field. Very few camera bags have a place for one. Obviously you have to get something that seals tightly to avoid a costly spill. Do you just keep drinks in a separate bag? I think it’d be too big for just that use, unless your M4/3 lenses are the f2.8 pro zooms – in which case, the size is ideal (Robin Wong tried it for this configuration). You can remove the internal divider and use it as a general purpose bag – no problem. (My dad even uses one as his travel bag without divider, and he’s not a photographer; we use one of the early prototypes as a diaper bag for our 18 month old.) If I’m not shooting with it, I usually have it configured with the single silo for a camera/lens and the rest for general stuff. Looks interesting. This would solve my main problem with other bags, that they are not collapsable in order to transport them empty in my main luggage. One doubt: I would use it with my Leica S with a lens attached in the middle (long-side as in the photo with the Nikon) and two other lenses in the left and right compartments. This should work but I wonder if it is not a little bit uncomfortable for the hips to have a body banging around in the centre of the bag. I ask because of the minimum padding. I do this with my Hasselblad H – no problem. There isn’t so much empty space inside with lenses that big that there’s room to move; the bag pulls itself flat and compresses the contents anyway if you wear it cross body. FYI, it will fit the SL-24-90 attached and 90-280 in another pocket with still some room left over. I had another customer who wanted to know, so I simulated it and measured. 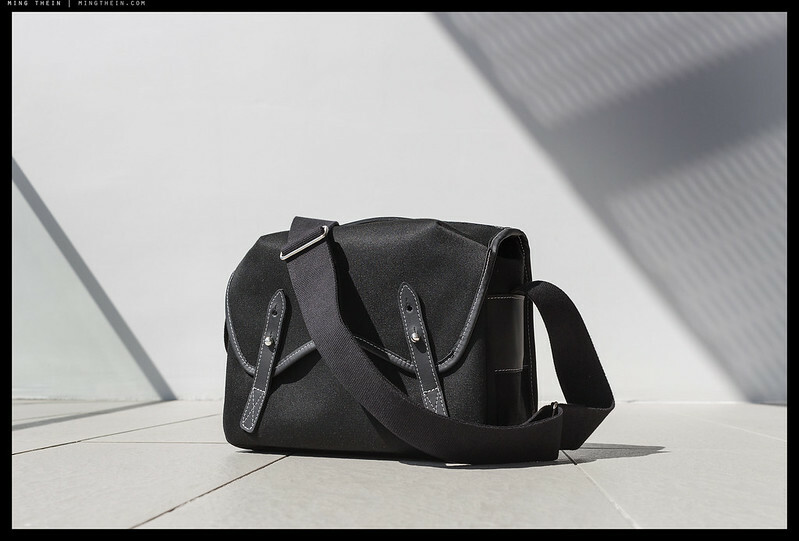 This looks like a sublimely beautiful bag, from every angle you look at it – but in the day and age of kick-starters and collaborations I just can’t help feeling that the Peak Design Everyday messenger bag wipes the floor with this for features and innovations – despite it’s obvious shortcomings aesthetically. I guess this is just another one of those Leica v Sony arguments where one is the technological marvel, and the other is the suave and classy contender. To add a little context Chris, I have a couple of friends who have the PD Everyday Messenger and have personally used the H5-D for an extended period previously. Based on Ming’s sample images above, I’m quite confident he has PD beat easily for practicality in field and storage space. Finally, and this is extremely subjective, having bought most of PD’s past products I find most features to be more troublesome in the long run. I’ll be happy to reconfirm this once I receive my unit of Ming’s bag. I haven’t seen either bag in person, only online… But the Sony-Leica analogy might be apt in that the PD seems to aim at ticking all the possible boxes for broad on-paper technical appeal with neat new features everyone thinks they want. Ming’s design is of the much more difficult to quantify ‘less is more’ philosophy. I was quite tempted by PD’s new sling on Kickstarter (they’ve raised $6.5M in their latest campaign! ), but just couldn’t determine how rigid it would be when not fully loaded. Plus IMO it’s somewhat ugly and impractical as a ‘lens changer’ type of bag. Ming’s design eschews rigidity and padding, allowing the bag to conform to the body and adapt to how much or how little is in it at a given time. That’s exactly what I want in a camera bag. The bottom pad is soft and flexible, and it does squash up if you don’t fill it. You could fold it in half if it’s really an issue. Oh no, don’t make it smaller 🙂 just less deep (ok, so that IS a little smaller, but only in one direction!). My usual problem is that mainstream camera bag makers often forget that users might do other things as well – i.e. go to work where they need to carry around stacks of A4 paper or books (but still want their camera and an extra lens with them), or on holiday where they want 1 camera with a couple of lenses and then the assorted holiday day trip things (e.g. souvenirs, sun glasses, phone, etc.). though, on the upside, there do seem to be more bag makers cottoning on to this with a variety of backpacks more suited to this kind of daytripping. I do love the look of your bag! And thanks for getting back to me so quickly! Easily done: don’t fill the front pocket, and you lose 1.5cm of depth straight away. I thought so too, but tried it both with and without during my usual 10h+ assignments and outings; worn cross body, the shoulder pad cuts into you, but the webbing is soft and doesn’t. Bloody hell. I thought I was pushing it with two Hasselblads, but he takes it to another level. Well done Ming! A well thought out and stylish product. Great to see your brand expanding. Order placed. For anyone working with smaller primes, any ideas on how to subdivide one of the three compartments so that it would hold perhaps 2 lenses without clanging together? Foam cutouts perhaps? Can’t wait for my shipment. Ming, very nice design. I think it works because it is flexible. An iPad pro 13″ doesn’t fit in it ? I honestly don’t know and have no way to test it as I haven’t got one. However, as noted in the post, a 13″ Macbook Pro Retina will fit. Looking up the dimensions, the 13″ MBPR is 314x220x18mm and the 12″ iPad pro is 306x221x7mm, so the naked iPad will fit, but your case may make a difference. 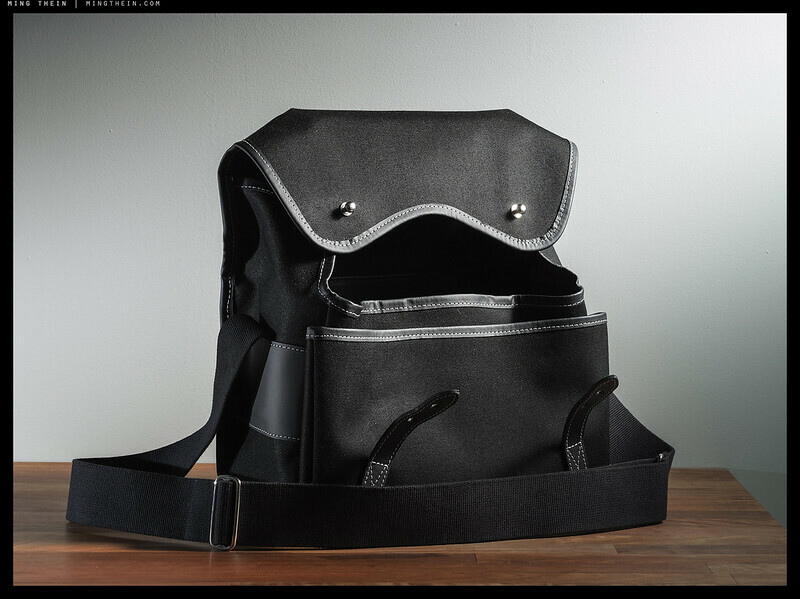 Bag looks interesting. I currently use a ThinkTank Retrospect 5 on a daily basis, and a Retrospect 7 when I travel/work. In my R 5, I have an OM-D E-M1 w/ 12-40/2.8, a couple of small lenses (17/1.8, or something), Kindle, reading glasses, sun glasses, music player, headphones, extra batteries, micro cloth, etc. When I use the 40-150/2.8, the R5 is really too low — but this combo fits better in the R7. If I’d like to bring my laptop (work, or editing photos using Lightroom), the R7 barely fits this + 1-2 more lenses. When on vacation, I often walk 15-30 km/day — taking photos, stopping in a cafe to read, etc. With the Retrospect 5, this is no problem. If I add the laptop, I can still walk quite a few km, but that is too heavy for a really long hike. Overall, the MT x FF is almost as tall as the Retrospect 7. The width of MT x FF is actually mid way between R 5 and R 6/7 — when looking at external dimension. The Retrospect 7 holds both a MS Surface Pro 4 (29.3 x 20.2 x 1) or a Dell XPS 13 (30.4 x 20.0 x 1.5) — both are slightly smaller than a MacBook Pro 13; I don’t know whether a MacBook Pro 13 fits in a Retrospect 7. A couple of alternative laptops: an HP Spectre 360 (32.5 x 22.9 x 1.1) and a Lenovo Thinkpad X1 Yoga (33.3 x 22.9 x 1.7) are slightly larger than a MacBook Pro 13. They won’t fit in a Retrospect 7. So … it looks like the MT x FF will be able to replace my Retrospect 7 + be slightly less wide and thus easier to carry. 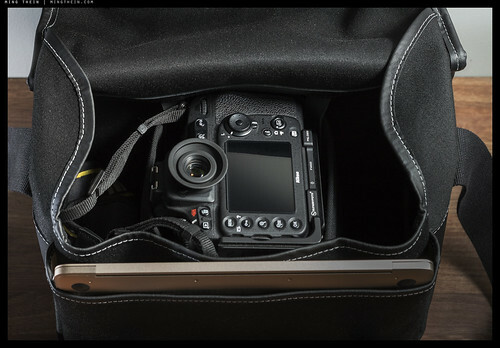 One thing I don’t like with the Retrospect series, is the dividers… they are slightly clumsy to adjust (like most camera bags…) It looks like the MT x FF dividers are simpler to use while maintaining flexibility. That sounds about right, thanks for the detailed comparison. I’ve seen the bag next to the R6/7 used by some of my students – it looks quite a bit smaller, probably because of color, and as you point out – will still hold a laptop of your choice. Note: MBP13 used for comparison was the thinner Retina model. Congratulations on your product launch! I hope you will consider applying the same design and thoughts to a slightly taller bag. I’d like to carry two cameras, with lenses mounted, to events and in general reportage type scenarios. have you considered making one just a bit taller that could carry a 70-200 f/2.8 mounted upright on one side and a 16-35 or 24-70 f/2.8 mounted upright on the other side, both on a couple of d810 or 5D sized bodies? Thanks. A bag like that would be too big to fit under an airplane seat. When shooting reportage I’d rather have the cameras out and over my shoulder or around my neck for fastest response anyway; in any case, the setup you suggest will tear down and fit into this bag fine with the 24-70 still attached and the 70-200 and remaining body separate. I’ll also add that though a taller bag can carry this long lens combination mounted, I wouldn’t personally transport that way – I think that’s asking for mount torquing impact damage. I’ll only keep both lenses mounted while shooting with the bag over my shoulder. For transport, I break the kit down, and wedge one body in the small centre section, 70-200 to right slot, and mounted 24-70 on the other. If I break both down, I can stack the bodies in the centre slot, with a padded cloth between them. I don’t carry much in the front pockets, at most two flashes, though you can stuff them until the bag becomes much larger. Placed an order but did not see any comment box to put in my phone number? Nope, sorry – that would have taken cost (and weight) through the roof, plus lost water resistance…has to be function first for me. Good points Ming, I think I’ll need to sleep on it some more. Just wanted to let you know that I ordered one as well. I have a Billingham which is huge and have been using a vertical messenger bag as a day bag to reduce the size and also mold better to my body. How do you suggest carrying a water bottle since I don’t see a pocket or external pouch for one? I would prefer not to tie up my hands and it gets hot here in India just as it does in Malaysia. Nice looking bag. I would order one but I am not fortunate to have a Hasselblad. I am one of those photographers you mentioned who “think wielding something expensive but not necessarily an optimal tool for the money sends very mixed signals: yes, you’re ‘serious’, but it might also mean you’re using money to make up for something else that’s missing.” So I will just continue to place my Leica SL and the questionable 24-90mm zoom in a brown paper bag. Indeed – the problem I’ve had with those is the lack of structure, both internal and external. We need that for our equipment, and this is reflected in the way this bag has been put together. My bag is the reverse: thinner if you don’t fill it, because if you wear it cross body it’s flexible and pliant enough to squash itself a bit. But it will accommodate 14cm+ if necessary. Looks like s nice bag. Now, does that there rear pocket take an A4 sketchbook? Fantastic looking bag. Well thought out, and appears it will be well made judging by the FF web site. Looks good, just ordered one! I too would also like to see one smaller. Maybe not as tall for us Leica users with the smaller lenses. Thanks – we’ll be working on it, judging by the demand. I think it will drop the laptop pocket and be much smaller…think two fully rigged mirrorless bodies with lenses attached, plus some accessories. A bag for a day out shooting. Not all of us need any devices larger than a phone whilst we’re out and about, just space for a 2nd body and two or three lenses. 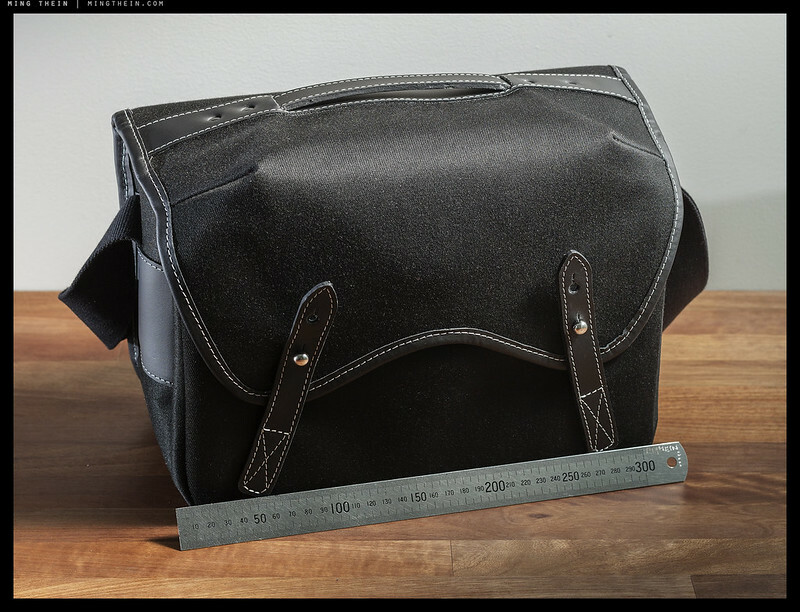 That said, my ideal Leica/mirrorless bag probably wouldn’t be far from this bag’s current on-paper dimensions. Just not quite as tall and thick. I’m just having difficulty correlating the stated dimensions with the photos. The dimensions seem on the small side but it looks bigger in the photos! This bag is a chameleon. It’s physically small but has huge volume…looks larger as the surface is plan and not broken up by details. Sounds good. Fairly thin but deep enough for G Master zooms attached to A7R2 I hope or at least 85mm Batis attached. Thanks. 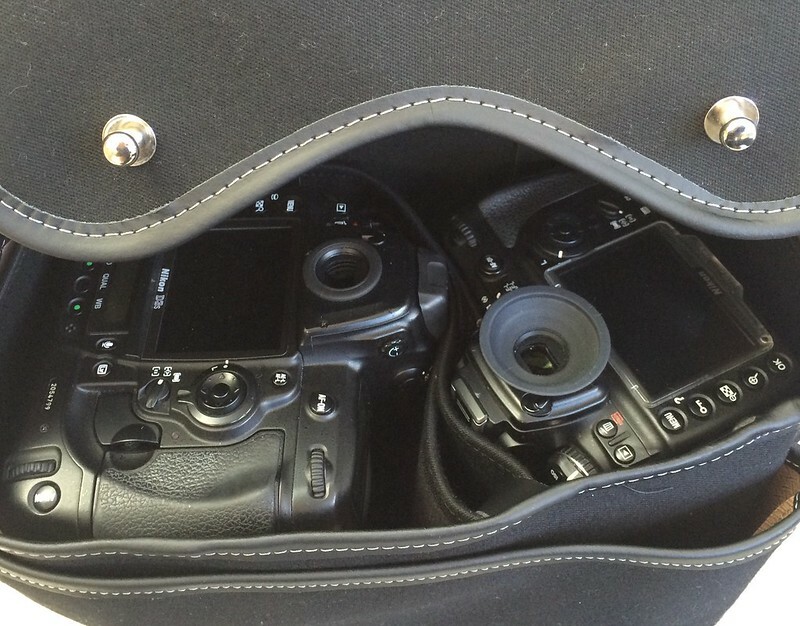 Err…I think you’ll need the existing bag for the G Master lenses – they’re huge. If I was to reduce size to accommodate only that, it wouldn’t be much smaller. As far as I know, it’s included. Looks the business Ming, the cat’s whiskers! Just ordered the bag! I hope this is the last bag I will be buying in a while. Adding to my Billingham, Domke, Lowepro, and Crumpler collection. If this does not work, then it’s time to get the Danish Souper bag! Very nice looking bag. It looks like it will hold the gear that I normally carry, but I’m not sure how much film it can carry. I carry 3 film cameras and so have plenty of 120 film with me too. My Billingham can carry close to 10 rolls of 120 film in the pockets. Any ideas what this bag can carry? Thanks. Assuming you’re not using the front pocket for a laptop, three 5-packs (i.e. 15) will fit with plenty of room to spare. Significantly more if you discard the boxes. My guess, without box, 20 if just in wrappers? Thank you very much. My current bag is a Billingham Hadley Large. My guess is that Falcon bag is substantially smaller. Would you agree? Thank you VERY much for your detailed response. ORDERED! Interesting and laudable initiative Ming; makes one think… Another vote for a smaller version, although I’d probably stick with my Tumi messenger bag (not a photography bag at all) with Billingham insert. Waterproof, lots of zippered pockets for assorted stuff, stores a 13″ laptop next to a D810 with a 1.4 prime. It gets used five days a week. As someone who has to carry their gear around all day,this bag could of been made just me for me.The design is perfect,you can see the thought that has gone into it.The colour & stitching looks great too.I will be selling my 2 Think Tank Retrospectives and ordering this later today. Another vote for a smaller bag if this one works out – something like the size of a Crumpler Dry Red boarding bag. It’s mainly around the thickness- with small cameras and lenses, I find everything rolls together in a thick bag. An alternative would be to fit some kind of long divider down the the middle – cameras and lenses on one side, jacket on the other. Incidentally I’d be a little wary of the pocket at the back not having any cover, I had a problem with a previous bag where if it rained even a little, the water tended to roll off the top, into the back pocket and pool there. 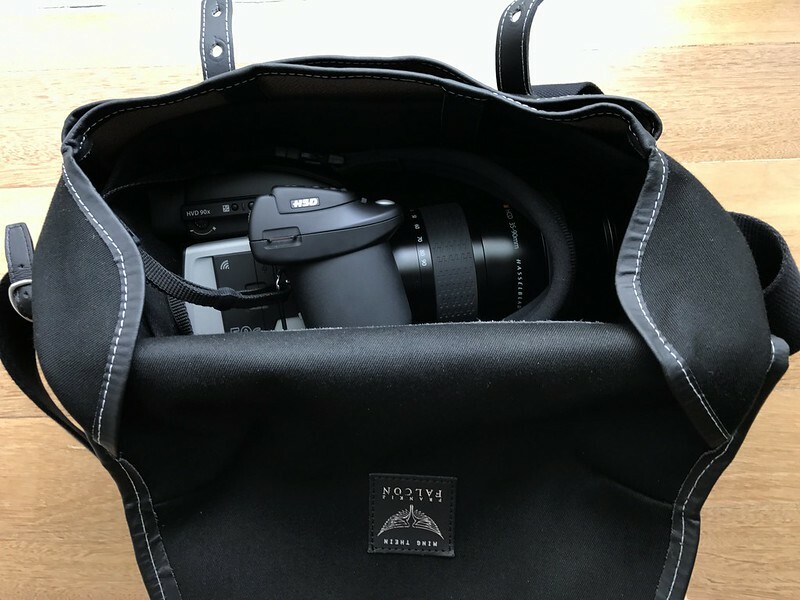 Definitely agree with you about the padding – most camera bags have far too much padding – I don’t need to stop a bullet with the thing…. Thanks. Noted on the smaller one, and back pocket. It’s separate from the inside, so it can’t leak in. ….but the pocket can fill with water, thus ruining whatever’s in it. It doesn’t have to be rain, it can be a spilt drink. It also puts your tablet ‘on display’ and renders it easy to pickpocket. Is it washable? i.e. can you put it in the machine when something really bad happens to it (like a milk drink put inside leaks). Aside from that, it looks good and well thought-out. I had kittens when I saw the price, but I assume it’s ballpark for something bespoke like that. It’s actually cheaper than a comparable mass-produced Billingham. Each bag is handmade. To do this, there’s basically almost no profit margin in the price. I’m doing it as a service to the photographic community rather than a profit making exercise. Wow, awesome! Thanks for doing this, Ming. I’ve already ordered mine. I hope the attractiveness of the price/quality ratio won’t impede Frankie Falcon’s business, I’m wondering how many have already been ordered. Ordered one. The water resistance will be welcome in the Oregon rain. So glad it is not over padded and not festooned with lots of pockets and zippers. The design and size trade offs look to just about right for my purposes. I love thoughtful design. Indeed, but I have a feeling that all cats will love your new bag! We’ll see, waiting to receive it.. 🙂 Many thanks again. I only wish the bag would fit a 15″ Macbook Pro but can’t have it all. If it were to fit a 15″ laptop, it wouldn’t fit under the seat and it’d still count as a separate piece of luggage – just too big. No way to physically make it any smaller since the minimum dimensions are set by the laptop. When travelling light, I use it with the H5 or H6 and 100mm attached, my cable bag of spares, another lens and a laptop. Just for reference re. bigger bags. I own both the Filson David Allan Harvey and the Steve McCurry bags (and sadly, many others) They are definitely a very, very different design, however, they are somewhat big (DAH) and very big (SMc) and they have one strap. If I was a two strap bag buyer (whew! say that ten times.) I would order the Ming Thein immediately. It appears awesome. Like all things photography this is just my humble opinion. I am happy to know that you are considering a future camera bag with a single front strap no matter what the size. Let’s see if we can make the geometry work. Main problem is the handle…you still need to be able to pick it up without the flap bending open. The more I come back to this the more I think you’ve nailed the design. The Billingham/Domke influence is clear and to my eye you’ve picked the best of both. Thanks Mike! Just sent you a note re. delivery too. Like the bag very much. It appears to be beautifully made with the best materials and the price is very very enticing. I have reached a point in photography, although, I have many bags, I always reach for and subsequently now purchase bags with only one front strap and not two. My favourite bag, at this time, is my Hadley digital. However it is quite small and I am not a pro, so my photography is not demanding in that way. Bags with two straps definitely have their place. Please consider in a bag in future with one front strap. It may give the bag a smiley face though? Still I would like to own it. Bags, as with all gear, are subject to the photographers greatest fear: that when photographers pass away their wives will sell off their gear at the price they were told was paid for it. Will do – one strap is preferable for smaller bags as it’s much faster to work with (I have a Hadley Digital too, with padding removed) but doesn’t hold closed properly for larger ones. Hi Ming, must say the bag looks fantastic! Will it fit a D800 with Otus attached, and still accommodate another Otus in one of the other compartments? Thanks – Yes, it’ll fit but with the 28 Otus on it’s a little tight because of the diameter of the lens. Length is fine. Hello: Is there any extra padding for the bag’s strap? It seems that carrying a full frame or medium format camera/lenses would be cause the strap to really cut into one’s body. Otherwise, the bag looks great! I tried it with a shoulder pad but found the bare strap more comfortable. It’s very thick, supple and double layered over the shoulder portion. Are there any life samples to check out locally? Well, more precisely any available to see/feel for the Singapore market? Or.. any local retailers looking to stock it in Sg currently. As good as it looks, I’m still old fashion and prefer to kick the tyres so to speak. Anyway, I’m wondering if the flap will flip back fully against the back of the bag (sandwiched between bag and body) so that one can walk around with easy access to the fully open internal compartment for grabbing lenses while on the go at events, etc..
Also, how abrasive is the canvas material? I’ve had bad luck with some nylon bag material causing nasty abrasion damage to wool dress pants over a relatively short period. I’m guessing it’s softer…? Stitching on final bags is a dark grey – there are a few more tweaks that will make it to the production bags (my last prototype one is light grey). It didn’t make sense to hold things just for a thread color. The flap can be ‘popped’ inside out and tucked inside the back pocket for this purpose. I sometimes use it this way if I’m parked at a single location for a while. This canvas (cotton based) is pretty soft; matte but smooth, fine weave. Similar to Billingham in texture actually. Thanks for the quick clarification and additional info. That all sounds good. BTW, I strongly agree with your bag philosophy regarding padding and ability to conform around the body. I also shoot a DSLR system and currently use a Shootsac for events, in part for its minimalism. But it’s not perfect, particularly with shorter, fatter lenses like Canon’s 85L that gets wedged into the Shootsac too tightly. Here your bag might be better in some respects and also look a bit more classy at more formal events, like weddings, corporate receptions, etc.. Glad to know the flap can be tucked in the back pocket to make it more of a ‘lens changer’ type bag. The more I look at and study your bag, the more I like it. Two more questions, please: 1) Does the strap have a shoulder pad? And, 2) Does the shoulder strap have any ‘anti-slip’ qualities — such as the Domke or UP straps — to help prevent it from sliding down on your shoulder? No shoulder pad, but compatible with the wide Billingham and Domke pads. In practice it didn’t prove necessary. The cotton webbing is rough enough that it doesn’t slide off. Is there an additional pad for the strap? Looking at the strap, and based on my own experience with similar straps, I would think that we weight of a full frame/medium format camera/lenses would easily have the strap cut into one’s skin. Anyway, just checking. No pad as it’s impossible to design one that works both shoulder and cross body without moving about too much; I tried it with both Domke and Billingham pads, but in the end it was better without. 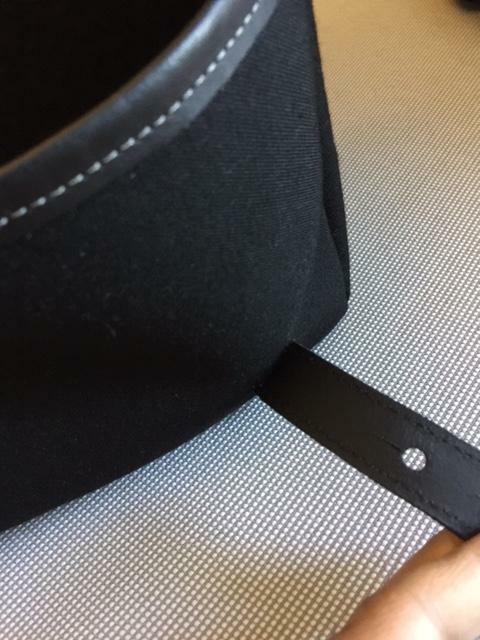 The strap itself is very thick and double layered over the shoulder portion, which means it doesn’t cut in. (Bad shoulder straps are one of my pet peeves too, and one of the reasons I don’t like the Katas despite their otherwise great design features – their straps are just too thin and sharp). I love so much about this bag. It’s clear that you’ve road tested it. Minimal padding (“in the right places”) leads to a deceptively large internal volume, incredible configurability with limited Velcro (and no zips! ), light and collapsible, and I also agree that it’s good looking. Sounds — and looks — great. What kills me is the size. I don’t shoot medium format, but Micro 4/3 and I prefer small prime lenses when shooting 35mm film. Would you consider doing one more of the size of the Billingham Hadley Digital? So, 21x13x21cm externally would seem to make it 19x11x20cm internally, which would be fantastic. 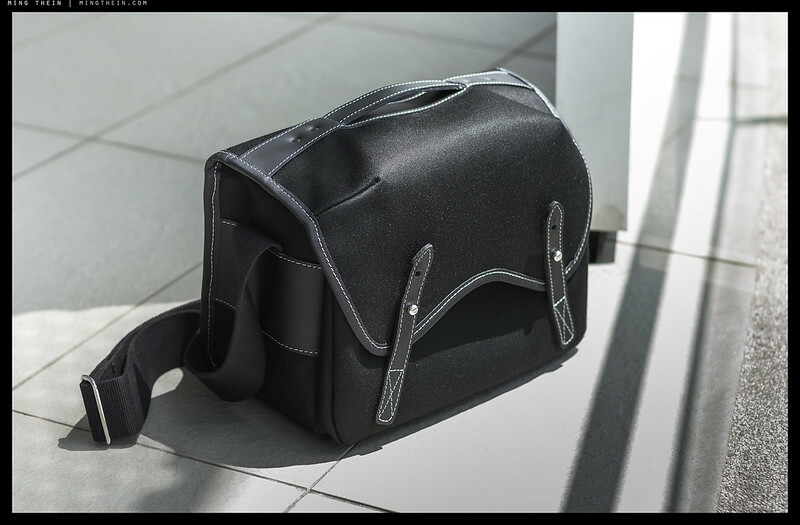 Hadley Pro – I think one dimension has the padding in, and one doesn’t. That’s funny, I shoot exclusively in mu43 and thought this bag was perfect for all my bodies and lenses v but I guess i didn’t think about how the lenses would be deducted in the bag. Think this is big enough to use as a mu43 camera bag plus a diaper bag? I’ve got my first on the way! I have been saving for an ONA Prince Street, and then I saw this! Bought a Red Helium s35 8k Stormtrooper to go along with this beautiful bag, having walked around Havana and Venice with the Ming I can attest that this will the most thought out, minimalist but fully functional, stylish stills/cine bag on the planet. And…it will match that cool Venetian Fedora he has. Really nice. This may be your legacy. I can think of only 3 or 4 photographers who will have a legacy on the order of A.A. But 50 yrs. from now the M.T. bag may be the new Domke ; or maybe it will be in MOMA. This looks great: I agree with the sentiments re. too much padding (for instance, I frequently currently carry the XPan and the D800E with lenses attached in two of Thinktank’s original skin pouches, with minimal padding and just a shoulder strap attached): your bag seems to be a nicer-looking and streamlined version of the already excellent Hadley Pro. While I’m not currently in the market for (yet another) new bag, I wish you well in this enterprise: success will be well deserved. Thanks! Yes, that was the idea. I think comparing this to the Hadley Pro may not be doing this bag justice. I’ve been using a Hadley Small for quite some time and really do love it, but I just wish it was ~1″ bigger on the long edge and ~1.5-2″ deeper on the shortest edge. This is pretty much what you’ve done here in my opinion. Overall great looking bag. Just ordered one. Any chance we could request a bag without the top grab handle? While I enjoy them sometimes, to me, it’s just one more thing that isnt needed, provides just one more thing to snag/get in the way, another way for a thief to get a secure grip on the bag, and also provides a way to potentially pickup the bag and drop all of your stuff inside on the floor if the lid latches arent secured. Thanks Phil. It’s an easy point of reference. No handle – this one is so low profile it doesn’t get in the way, and when you have it – it’s there. Location is closer to the back side, so even if you pick it up unsecured, it won’t belch the contents out (I tried). Well done, Sir. Now I must convince the wife to let me get one. Looks very nice, unfortunately as someone with a shoulder injury, if i put my 500cm, D800, 2 lens an a tablet, I shudder at that weight on a single strap. Oh I know. Just grumbling about the limited options and countless bags I’ve tried previously. It looks great! Can’t wait to get mine. Ordered! I’ve been looking for a shoulder bag for a while and I’m willing to give this a shot, it looks great! The “continuous loop” divider is genius. You should patent that! Thanks Matt! I can’t take sole credit for a team solution, but yes – one strip of velcro to rule them all! “sweaty camera strap” Mmmm, nice. This has to be the handsomest camera bag I’ve ever seen, Ming. All the best with your venture. Hmm.. Seriously need to count the pennies to see if I can afford it right now, just went and bought a ThinkTank bag, but but… Love the look of the bag and I think it would fit my needs very well. I am especially fond of bags which form around the body, I despise bags that bounce on the back and scream camera bag! and I glad for that.! Ming, this bag looks graet – I will need to check out and consider it seriously. 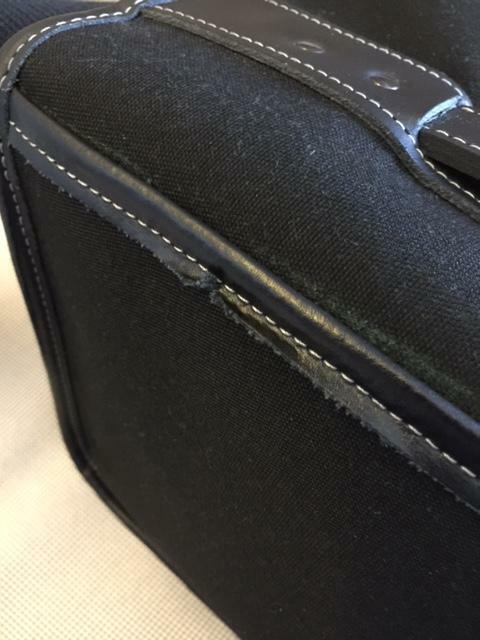 I currently have Wotancraft Avenger which is a great bag (unfortunately I had to send it for some warranty repair … to Taiwan). M question is – if this bag would need a warranty repair – where would one be sending it to? Also – does a hardcover A4 notebook (like Moleskine or similar) fit in the back pocket? Thanks Matus. Production and warranty are handled by Frankie Falcon in the UK. Just checked – it will fit an A4 notebook in either back or front pocket (the front is obviously deeper, and more comfortable to carry as you don’t have a board against your back). I can easily get an 80 page soft Moleskine A4 plus my 12″ Macbook in the front. The two side accessory pockets are tighter at the mouth than the bottom, and the lid flaps cover them over – stuff doesn’t fall out of there, plus it’s pretty snug. Handsome bag and the internal volume is shockingly big for the size. I have been using a Lowepro bag that is externally bigger but has about 6 liters volume. With your bag I can potentially fit my entire system in just one bag. Judging from the images, E-M1, two zooms and three primes will fit easy with room for two flashes and assorted filter and other small stuff. Order placed, this looks like a bargain especially when it is shipping from EU. For M4/3 system: it’ll fit the three Oly f2.8 zooms (7-14, 12-40, 40-150) each with a body attached. The secret is eliminating the padding you don’t need. That’s pretty sweet, especially for one who wants to employ multiple systems. 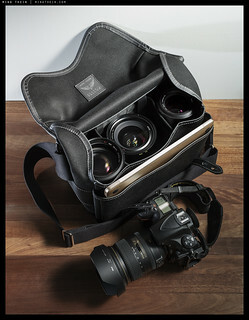 I have been researching multiple bags to suit a µ4:3 system and a Nikon full frame system. Now I only have to consider tripod bags and more rigid system containers with foam for maximum security. A practical bag from a hardworking pro! I already have my cologne/perfume needs covered by designer Karl Lagerfeld (who’s quite a fashion photographer himself) with his Photo cologne created a few decades ago and is still my favorite cologne. I recall an early user jokingly asserted it smelled like Kodak’s old Dextol paper developer. ;-). ‘Overheated Silicon’ and ‘Long Exposure’ can be the follow up fragrances to ‘Sweaty Neckstrap’! Such a practical design and doesn’t compromised on look. Order placed! Two quick points/questions: 1- Maybe it’s just me, but I have an aversion to black camera bags — for several reasons, including that it always seem to advertise ‘camera inside’. I’ve worn my old Domke dark/forest/olive green until it’s about in need of replacement. So, do you plan to offer this bag in any other colors? 2 — Like your design a lot, for the reasons you mention. Seems to have many of the advantages I look for, plus a little more usable space than my Domke or Billingham. I usually like a ‘day kit’ of my D810 plus 4 prime lens — including 1 attached to camera. My two favorite bags only have room for the body with one mounted lens + 2 extra, without stacking — which I don’t like to do. Do you think your bag would work for my D810 + 3 extra without stacking? Colors: not for the moment. Black is visually smaller and stealthier, which is why I chose it…also, lower maintenance as it shows less dirt, too. Volume: depends on the size of your lenses. If they’re thin, you could either put one at one corner in the front compartment and have it poke into the rear, with camera mounted in the centre – or you could add a pouch to put them side by side. The inner compartment is actually about 14cm deep. We didn’t design it for infinite numbers of divider combinations as that just tends to waste space (and velcro is annoying). Hmm…I don’t think anybody would want to smell like a sweaty camera strap!